Phone Number of Aero Contractor Nigeria is 01-6284140 /+234-9-8100287 / +233-21-766150 /+233-542-030437 . The address of Aero Contractor Nigeria is Private Terminal Domestic Wing Murtala Mohammed Airport Ikeja, Lagos. The email address of Aero Contractor Nigeria is customercare@acn.aero. The Website of Aero Contractor Nigeria is www1.flyaero.com. The customer support phone number of Aero Contractor Nigeria is 01-6284140 /+234-9-8100287 / +233-21-766150 /+233-542-030437 (Click phone number to call). The postal and official address, email address and phone number (helpline) of Aero Contractor Nigeria Service Center and Aero Contractor Nigeria customer service phone number is given below. The helpline of Aero Contractor Nigeria customer service phone number may or may not be toll free. Please ihave done my check, but has not been sent to my email. Please this my email address jideoforkoye60@yahoo.com pnr numuber b3hg61. Paid for two tickets at Uba on 15/07/2016, uptill now have not receive the tickets. My wife and two children needed to travel from Lagos to asaba how much will it cost my children age are 11 years and eight years and my wife only. Good Day, My name is Chibuike Egejuru and I booked a flight on 24th August 2015 that is on Monday this week, but missed the flight. Actually what happened is that the flight was rescheduled from 15:35 to 13:30. Below are the details of my flight ticket pleaseConfirmation Number: 9JR1UUDate: 24 Aug 2015Flight: NG 342Class: Economy (Y)Departs Owerri: 15:35Arrives Lagos: 16:40Name: Mr. Chibuike Egejuru Ticket Number: 7082006673017Confirmation Number: 9JR1UUThank you in anticipation for you kind assistance. Chibuike Egejuru . I booked Aero flight to Lagos from Abuja for 8:30am / 25-08-15 and the return to Abuja set for 11am on Thursday 27/08/15. 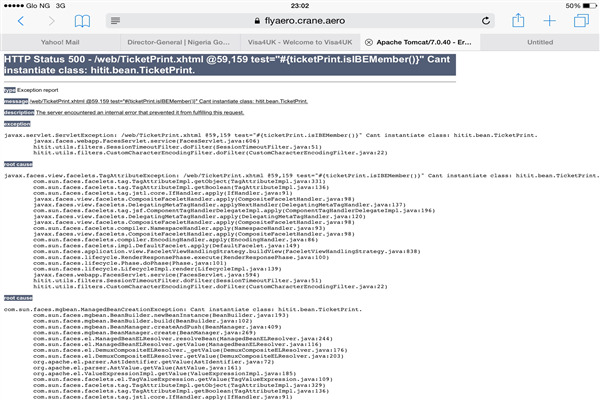 I saved the ticket on my iPad reading list, but now I can not open the page as it keeps saying error report. I do not have the ticket no off hand and I need to change my flight times urgently. Please what do I do?. Good evening, please I need my ticket to be open(suspended), ticket number(PNR)Aero Purchase Notice:Book Code:9FE9TE 2015. 07. 29 10:35 LOS-PHC 2015. 07. 31 19:00 PHC-LOS. Hello, I tried to book a flight from PHC to LOC. I paid with my card, but it came up with an error: **PAYMENT_ERROR_GT1E100_Transaction Completed, but Error Occurred during Payment Confirmation (Please Requery the Gateway)My Account has been billed and the amount deducted. My PNR NO is 8WM57RPlease kindly look into this as soon as possible as i want to be able to fly tomorrow. Thank you. To whom it may concern - 8QYGZ3 I purchased an E-ticket from Lagos to Abuja today and the payment, I noticed the following error statement: "**PAYMENT_ERROR_GT1E100_Transaction Completed, but Error Occurred during Payment Confirmation (Please Requery the Gateway)"Please could you assist me in resolving this issue. A total of =N= 10, 510. 00 has already been deducted from my GT account. 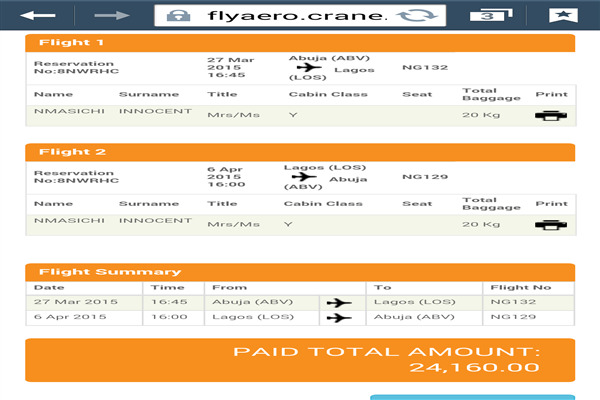 I will appreciate it if you could help to generate my confirmation for this flight as indicated on the transaction. The PNR No. Is: 8QYGZ3. P lease, I booked a flight on Friday wit reservation number 8nwrhc and I which to move it backward ie on the 26th of March 2015. Please kindly furnish mi with what i need to do to revert this. Thanks. Today, Saturday March 21, 2015, I booked a flight to travel from Accra to Lagos on March 26, 2015 and the sum of 27, 750 Naira was deducted from my GT Nigeria account. To my surprise, instead of being able to print my ticket, i got an error message "*PAYMENT_ERROR_GT1E100_Transaction Completed, but Error Occurred during Payment Confirmation (Please Re-query the Gateway)"Immediately, I called GT connect to intimate them with the problem. I was made to understand that Aero Contractor was supposed to send a rejection mail. I have not received anything from you up till nowKindly use your good office to rectify this anomaly. This is the second time I am having this experience. I hope Aero contractor would not make me to suffer like the other time. Thank youDr Elizabeth Oloruntoba. Just want to confirm that the flight from Abuja to Asaba tomorrow, Monday 9th February, 2015 at 9:00 is still going. And that of 4:30 from Asaba back to Abuja will be returning. Thank you. My flight was rescheduled to 19. 40 as against the original 16. 45 that i booked for at the booking of my flight. My flight is scheduled for today 28th of January 2015. Please i need prompt response as i am not sure if the message came directly from aero, to avoid missing my flight. I paid for three adults and my PNR is 8AHUZ7 AT Kwame Nkrumah University of Science and Technology branch of UBA on 1/19/2015, but up till now my E ticket has not been sent to my e-mail. I tried to check in online with my PNR number, but it showed error that customers name could not be found. What should I do. Good morning please I paid for a ticket online with my verve card on the 18th of January. From you yo to Abu, I haven't gotten my pnr sent to me. I would like to know why. My name is EmeldaJimmy. I have a flight for tomorrow 5:50 which has been rescheduled for 19:50. I want to change it to 7:15am tomorrow being 11:01:15. Please I a response. Good evening, I have a little challenge here. Tried booking my flight online for Monday 22nd December, PH-LAG, 16. 00hrs. After going through the normal process and the sum of 16, 350 was deducted from my account (I got the alert), I got an email that my transaction has been completed, but there was error during payment confirmation (please requery gateway). Really do not know what that means because the money has been deducted already and am yet to get my reference code. I want to change my flight date. Actually I booked for 17th of this month; ie 17/12/14. The departure is from Lagos to PH and I paid immediately online. But I have an interview on the 23/12/14 here in Lagos, so wish to change the date from 17th to 28th of this month. Please let me know what and how to go about it. Waiting for your kind response. Thank you sir. Chinwendum Sonia. I booked for portharcout to lagos on sundae for tomorrow 16th of December 2014. The money has being deducted and I have not received an flight details. I want to change my daughter's flight from Sokoto to Lagos formerly scheduled for Wednesday 26th September to Tuesday 25th due to changes in their NYSC camp procedures. How can I do that from Lagos for her? She is a Youth Corpse serving in Sokoto and she has her return ticket with her. Thanks. Her name is Odunaye Raheemah Olorunfunmi. I booked ticket in this morning and paid with my ATM card, but I have not seen any message to know if my money was accepted and I have my ticket or not. Please i want to change my booking form thursday 18/09/2014 to wesday 17/09/2014. My name is ogunniyi esther iyabo. Booking number is 7e8jj8. Please treat as urgent. Please i want to reschedule my mother's flight (mrs chioma atueyi) from lagos to abuja which is on 6th July, 2014. Because of of the closure of the airport for maintenance. Kaduna is too far for me to pick. Because i am very heavy now and due to deliver my baby. I cant under the stress of traveling to kaduna with my condition. Please i will be grateful if i can be rescheduled for monday 7th July, 2014. I hope to hear from you. Thanks for understanding. My name is my shedrack oyedotun, i book a flight on 1/07/04. From abuja to lagos. Which the confermation number is 6rtzb9. So now i want to pay in the money to the bank. Just want to conferm maybe i can stell pay in. There's an error in my return flight to uyo from abuja. My return ticket is on the 6th of June,2014 and not 9th of June,2014. My name is john andrew. Please correct this error. I did an online booking using mastercard. I am a plumber,if anything wrong for the plumbing work in your company such as maintainance or new work or if there is need of plumber to staff in your company,am living in portharcourt(this my number:07062988712). i booked for my flight from lagos to Abuja for 5th of August and i haven't gotten any confirmation from you guys yet. Please i'd like to know what the status of my booking is. Please i tried booking a flight from lagos to abuja yest and till now i habent gotten any confirmation and i have already made payment. My flight is supposed to be for 3pm tomorrow, Monday 5th 0f August. Thanks.